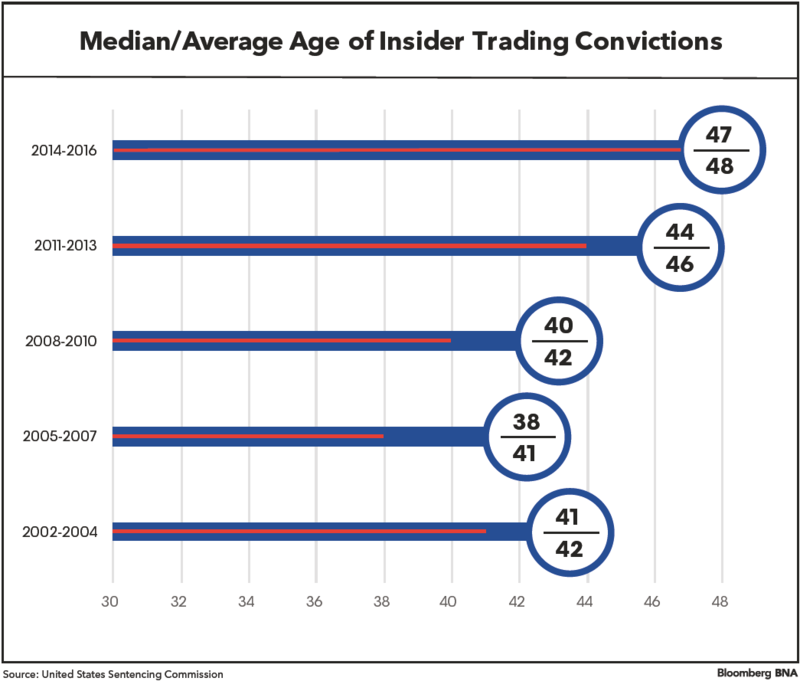 The average age of those convicted and sentenced for insider trading has steadily trended upward since 2007, a Bloomberg BNA analysis of U.S. Sentencing Commission (USSC) data shows. The median age of those convicted went from 38 in 2005-2007 to 47 in 2014-2016. Before 2011, average ages may have trended younger because of numerous cases against large insider trading rings, some of which involved dozens of low-level traders in their 30s. These cases included the “squawk box” prosecution (U.S. Securities and Exchange Commission v. A.B. Watley Group, Inc. et al), the Croatian seamstress case (Securities and Exchange Commission v. Anticevic), and the UBS ring (Securities and Exchange Commission v. Guttenberg et al). Without those cases included, the average age of those brought up on civil actions, as opposed to criminal cases, by the Securities and Exchange Commission in 2007 was 47. With them included, it was 42. A few recent cases have also featured defendants in their 60s and 70s, like Robert Bray, the 78-year-old owner of a Boston-area construction company, and Billy Walters, the 70-year-old celebrity sports gambler, whose case involved disposable cellphones and high-profile figures in sports and business. Peter Henning, professor of law at Wayne State University in Detroit, told Bloomberg BNA that insider trading tends to trend older, especially when it involves senior corporate executives. “Not a lot of people in their 30s can invest in the markets. But someone in their 60s that has capital and seniority in their field can,” he said by phone. “The stereotypical insider trading by longtime golfing buddies, that’s something that 50- and 60-year-old guys do,” he added. 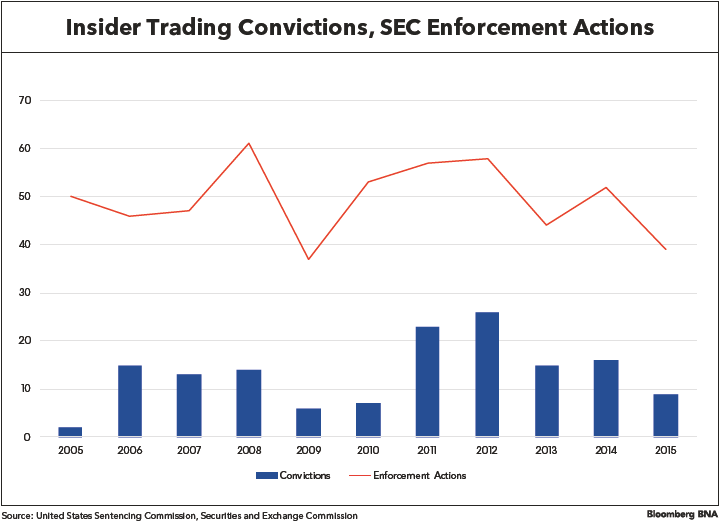 Enforcement actions and convictions for insider trading have been on the decline since 2012, following the 2009 breakup of the insider trading ring connected to Sri Lankan-American hedge fund manager Raj Rajaratnam. The Rajaratnam cases led to a relative swell in enforcement for the agency in 2011 and 2012, with almost 50 convictions and 115 enforcement actions between the two years. The recent Supreme Court decision in United States v. Newman has made prosecuting insider trading cases more difficult because of its mens rea requirement: that the prosecution needs to show that accused traders had knowledge that the information they were trading on was provided by an insider for profit. As a result, numerous cases have been dropped and guilty pleas vacated as a result of the decision. But the total number of enforcement actions since the decision—39 in 2015 and 45 in 2016—are not far off from the yearly average pre- Newman: about 50 insider trading actions per year . Henning didn’t think the Newman case has had any significant effect on enforcement. “So far there hasn’t been much of a cutback,” he said.